During the first half of the nineteenth century, Alexis Soyer, a Frenchman from Meaux, was the most famous cook – and one of the most famous men – in London. But that is not the reason – or not the only reason – why he is interesting. A combination of chance, talent and energetic social conscience took him into many of the great events of his times. Born in 1810, he cooked his way through the Paris July Days in 1830; fled to England, where he was cook in a great country house during the Captain Swing riots in 1832; oversaw the building of London’s most modern kitchen at the Reform Club, where he was head chef from 1837-1850; designed a model soup-kitchen which he took to Ireland, at the Lord Lieutenant’s request, during the 1847 famine; opened London’s first Parisian-type restaurant in conjunction with the Great Exhibition in 1851, having turned down the official catering contract; and in 1855, horrified by W.H.Russell’s reports in The Times, went to the Crimea to take over the running of the kitchens in Florence Nightingale’s hospital at Scutari – having first designed a new army cook-stove, economical, portable, and practical indoors or out, a design that remained in use until very recently. When he died in 1858, he was helping Miss Nightingale reform British army catering. Here is the first half of the nineteenth century seen from the culinary point of view. The book is arranged, as the title implies, as a dinner-party, the different courses (I cooked them all) each taken from one or other of Soyer’s various recipe books. Each course is correct for its place in the dinner, but is also chosen for its relevance to the subjects discussed in the chapter in question. What were the differences between French and English food at this time, and what caused them? Why did the French favour restaurants, while the English preferred clubs? What did the very poor eat, and why did the Irish ignore the fish that teemed all around them? What was the position of a chef in society – was he an artist, which was how Soyer saw himself, or just a servant? (Interestingly, his personal life was conducted in artistic milieux that reflected his classless and cosmopolitan outlook. He married a painter, and after her death conducted a long affair with the ballerina Fanny Cerrito.) Why did Soyer so energetically take up the cause of the poor? Was it because he himself had been born poor and knew what it was like? Or because he was a Protestant and Protestants in France at that time were radicals and outsiders? Why was he able to get along so well in Turkey (as he did)? What did the men eat in the Crimea? Why was the French army there so much better organised than the English? 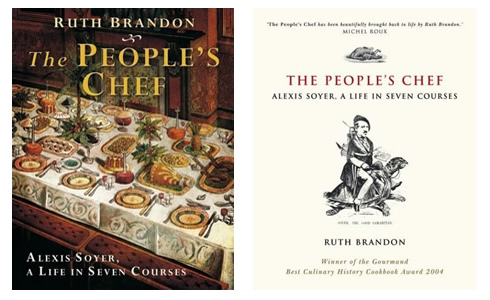 The People’s Chef, part cookbook, part biography and part history, is an unusual mix with a charming and highly original hero. Perhaps not coincidentally, this is the third time I have been attracted to a subject who made his mark despite being at best semi-literate (the other two were Singer, the sewing-machine magnate, and Houdini). People like this are of course unusually driven, and I’m interested in what drives them; but they also require a rather original approach to biography. Since there are no diaries or correspondence, these lives must be traced almost wholly through their acts; and these acts (in Houdini’s case magic tricks, in Soyer’s, the creation of meals) thus acquire a symbolic significance. Houdini’s tricks lead to a consideration of what constitutes real magic; and Soyer’s dishes take us behind the scenes of great historical events, deep into the life of his times. As the title suggests, The People’s Chef is arranged as a dinner party in seven courses, introduced by a Menu. This entry was posted on Sunday, March 21st, 2010 at 5:43 pm	and is filed under Non Fiction. You can follow any comments to this entry through the RSS 2.0 feed. Responses are currently closed, but you can trackback from your own site.